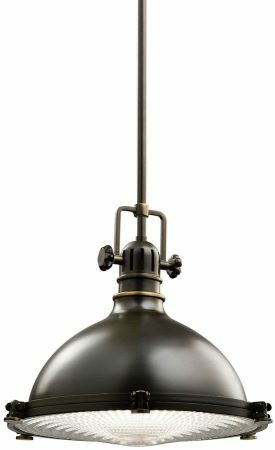 The Hatteras Bay medium industrial kitchen pendant in olde bronze, part of an industrial style designer kitchen lighting range finished in olde bronze or antique copper, supplied by Elstead Lighting and designed by Kichler. This unique collection makes a distinctive statement with its prismatic lens and industrial lighting style. Produced from medium up to extra large sizes, they are available finished in olde bronze or antique copper. Superb quality 34cm medium kitchen pendant, suspended from a circular 127mm olde bronze ceiling mount by a central drop rod. The medium industrial style bell shade is finished in olde bronze and features top ventilation slots and two knurled adjuster screws. The prismatic glass lower lens is secured by a hinged retaining ring attached using knurled thumb screws. Supplied with two 15cm and two 30cm rods that can be fitted in any combination to suit your ceiling height, please see the technical information below for minimum and maximum heights. The perfect companion in a stylish modern kitchen installed over a dining area, breakfast bar or island. Ideal for use with a very bright energy saving compact fluorescent spiral lamp. Other fittings in the Hatteras Bay industrial kitchen pendant range can be viewed below and includes different sized pendants finished in olde bronze or antique copper. Designed in the USA by Kichler, founded in Cleveland Ohio in 1938. L.D. Kichler & Co. is a family run business held in high regard for their diversity of design and breadth of range, which includes some truly striking contemporary and substantial light fittings.